We awoke to the construction next-door the the KOA (new condos), and everyone gathered their daily needs and we cruised back to our familiar meeting spot the park and ride at the north end of town. Here we got checked in for the run along with 25+ other rigs. 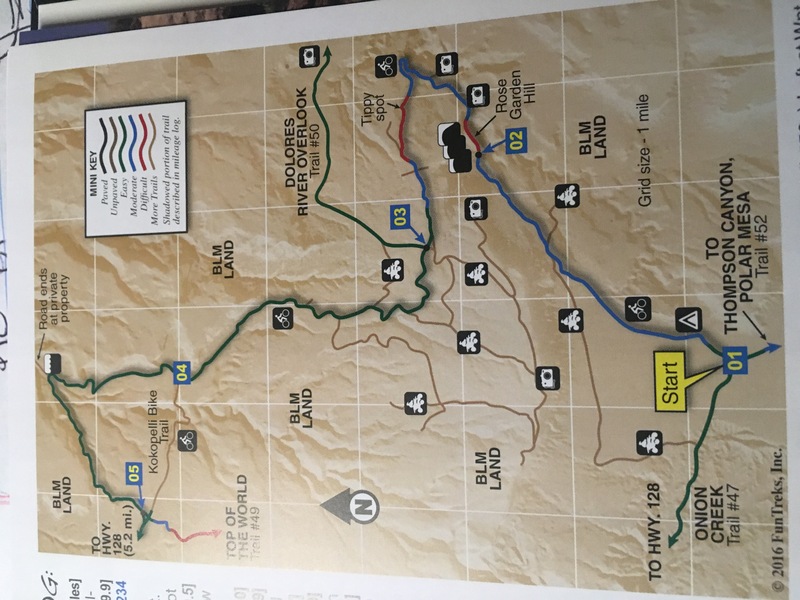 The plan from our leaders of the day was to traverse about 25 miles of highway 128 and turn off on Onion Creek Rd, where we would air down and gather for a driver’s meeting. And we were off, although with this many rigs, it wasn’t a very fast pace. We were in the front half of the pack which did not allow for many picture stops along the way. We only traveled about 3 miles in to the two obstacles one being a short off chamber section and finally Rose Garden Hill. It reminded me of Mashed Potato Hill (We saw last year) on steroids, and then waited for all of the rigs before us to conquer the hill. No kidding we waited over an hour inching forward before our turn at this spectacle of a rocky 1/4 mile 10% grade uphill challenge. We ate our lunches while waiting, walking up and back a few times to see this challenge. But by about 1:30 pm local we were on top waiting for those behind us (some 15 rigs) to get up. Once everyone was up we had another driver’s meeting of sorts, deciding on our trip out as everyone needed to cover another mile or so to the turn around point and back the way we came. Now having heard there was an adjoining trail to Top Of The World, itching to get out of the larger group, and knowing that neither Mandi or I had got there a couple days earlier, I asked about this trail, and we all decided to take it out leaving most of the group behind. Much to our surprise another 5 or 6 rigs tagged along. Now this was the long way out as it added another 20 miles of dusty trails, but we were all up for it. By the time we got all of the rigs with us out to the turn off to Top Of The World 3 rigs decided to head for the highway, but we stayed on task and took group back up to the Top, Jim Mueller joined us from the west side for the day. After topping out and getting pictures, we blazed a trail for the highway, with the sun fading as we aired up, we returned to Hwy 128 for the 30 mile ride back to Moab, deciding we’d meet at the Atomic Grill for dinner. We followed Steve out, because earlier in the day we noticed his break lights weren’t cooperating. Along the way we stopped a couple of times so that Mandi and Stephanie could grab shot of the surrounding in the sunset, which really brought out the colors. After catching up to the rest of the gang, at Atomic, we ate and headed back to camp, for some desired adult beverages and stories about the day around Steve’s fire pit. Next Up Strike Ravine!